Alongside last weekend's inauspicious Pokemon Go Fest, Niantic finally opted to release Legendary creatures into Pokemon Go. The first of these Pokemon is Lugia, the Legendary bird from the Johto region and one of just two Legendary creatures available in-game so far. Players looking to add Lugia to their roster have a tough battle ahead of them, but despite substantial odds, capturing Lugia isn't impossible. Here's everything we know about how to find and capture the legendary bird Lugia in Pokemon Go. 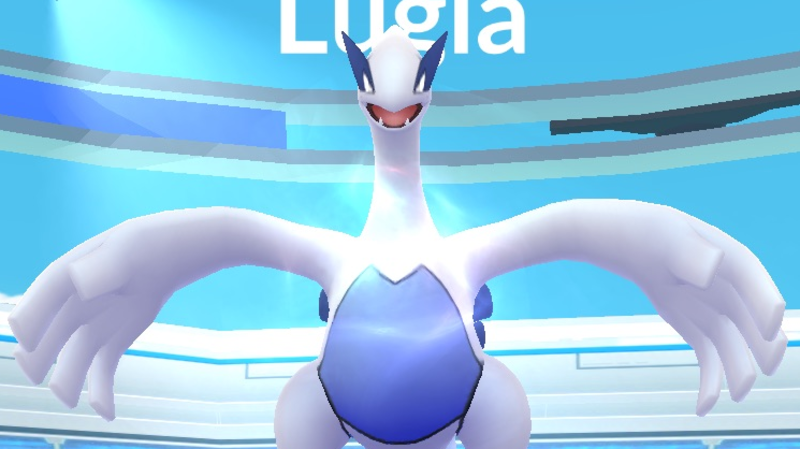 Same as with capturing the Legendary bird Articuno, Pokemon Go players who want to find and catch Lugia will need to find a Legendary Raid battle featuring Lugia as the raid boss. This should be fairly easy in urban areas with a lot of Pokemon Go gyms, but for those who live in more rural areas, finding a battle won't be near as hard as putting together a solid Raid Battle team. Fortunately, we've got a guide on how players can use Silph Radio to link up for raid battles. Even with a full crew, taking down Lugia won't be easy. The creature typically has a CP in excess of 40,000, meaning trainers would be wise to get as close to the maximum limit of 20 raid battle participants as possible. In addition, it'd be a good idea to bring along all of the Pokemon that Lugia is weak against, including the likes of Golem, Tyranitar, Jolteon, and Omastar. Golem and Tyranitar in particular are good choices, and we've featured them before on our guide to the best Pokemon to take down raid bosses. In addition, players who happen to have a high-level Gyrados in their lineup will find that the creature's Hydro Pump is a particularly effective offense against Lugia. After the battle has been won, players will finally have their chance to capture Lugia. Luckily, after raids, players will be given a number of Premier Balls in order to capture the creature, and the likes of Golden Razz Berries can help turn the tide in their favor as well. There's no guarantee of a catch, of course, and so-far the capture rates for Lugia are quite low. Still, with persistence and careful planning, players shouldn't have too much difficulty in adding the Legendary bird Lugia to their Pokemon Go lineup. Looking to learn even more keen Pokemon Go tips and strategies? We've got a large selection of guides and other miscellaneous how-to articles featured over on our Pokemon Go tips and tricks guide hub.